You do not meet someone who has followed his passion throughout his life every day. So November 27, 2011 was really special in the fact that I had the opportunity of meeting Bhai Mian and his son Jamal who have spent years making and flying kites all over the world. 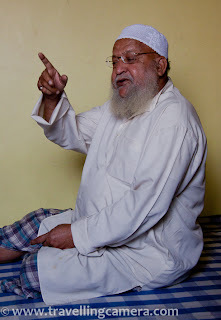 Bhai Mian is 85 years old now and his movement is severely restricted because of Diabetes. And this was the reason why the person who had put me in touch with Jamal had woefully predicted that probably I'll not be able to meet the national awardee at all. In fact, according to him, I would be lucky to get to meet his son in person. But when I called Jamal on his mobile, he agreed to meet me at his place in the famous Delhi 6. Full of anticipation, I and my photographer friend followed Jamal through the labyrinthine lanes of old Delhi. 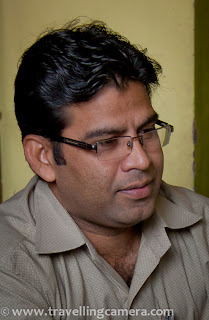 This was the first time I was going to enter a home in Old Delhi and the prospects were exciting me to no end. My imagination had run wild and I had painted various pictures of the supposed abode of the great man but I was in for a surprise. One unique thing about the buildings in Delhi 6 is that often when you are standing in the street, you can't look up and guess how many stories the building houses. Soon we stood in the dark staircase leading up to the residential quarters of Bhai Mian and his family. Gradually our eyes adjusted themselves and we were politely escorted by Jamal to a room where daris had been laid out to make for a comfortable seating arrangement. 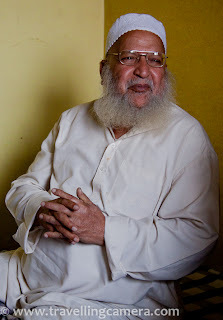 And to our delights, soon the God Father of Kite-Flying, Bhai Mian himself entered the room. We couldn't have asked for more. Misty-eyed, he fondly recalled his active years and, humbly pushed aside all requests to talk about the National Award he's received or the Record for which his name is registered in the Limca Book of World records with a simple "Awards to milte hain bachche, magar apne haathon se patang bana kar, us par kanne kas kar, udhaane ka jo mazaa hai, uska koi muqabala hai?" He recounted his experience of flying kites in various countries such as in The Dubai Shopping Festival in 1993 where he flew a train of 1184 kites and at the Kite-flying competition at India-Pakistan Border to celebrate the 50 years of Independence. He vehemently maintains that Indian Kites are the best in spite of the active Chinese intrusion in Indian Kite Markets. "China ki patangon mein balance nahin hota. Indian patangein ungliyon ke ishaare par naachti hain." His opinion, in fact, is shared by many others both in India and abroad that the Indian Kite is the ultimate fighting machine. Passion and creativity has driven this man, whose family business is Jewellery making, ever since he was a child and he has made kites in all shapes and sizes. His smallest kite 2mm long and the biggest being 400 feet in length. He takes pride in his collection of carefully crafted kites shaped to look like a peacock, a snake, various birds, and animals. His endeavour to better his previous acheivement stems from an insatiable desire to do something that has never been done before. "Koi cheez aisee udayen jo sab dekhen to kahein ki yeh to pehli baar udte hue dekhi hai." The family has lovingly preserved some special kites for years. Some of the oldest kites that they proudly showcase are over 50 years old. There are others that they treat as works of art and are not willing to sell at any cost. Jamal fondly remembers one particular time when he was sitting at his counter at the Craft Museum and carefully constructing a minute, few mm long kite. A gentleman was oberving each of his artistic touches carefully. And once the kite was ready, the gentleman offered to purchase it. Jamal politely declined saying that he could have any one of the other kites if he wanted but this particular kite wasn't for sale. But the gentleman was adamant and he kept on increasing the amount he was ready to pay for the kite. But Jamal wouldn't budge. The Gentleman then approached one of the managers of the Craft Museum to request Jamal to see the kite. Jamal then presented the kite to the gentleman as a gift. "Kuch cheezon ki keemat aankna aasaan nahin hota." The gentleman not only accepted the gift but also bought some kites from Jamaal that were actually up for sale. Not only have Bhai Mian and his sons been making and flying kites, they've also been conducting kite making and flying workshops for school-children and even for the adults. Despite our fear that the popularity of kites might be on a decline in India, Bhai Mian is ever an optimist. He argues that till children are enthusiatic about kite-flying, we have nothing to fear. Kite flying is an art and, like one does in other sports, one has to take time and learn the art. On one 15th August, when Bhai Mian was still a child, his father advised him not to tie kanne of all the kites he was planning to fly at once. But being an impatient child, he still went ahead and did that and started flying the kites. Soon all his kites were lost in kite-cutting battles and he was left without any more kites to fly. His father generously bought him another batch and sat him down and talked to him. "Ek baar mein ek hi patang ke kanne baandho. Phir jab woh kat jaye to doosri patang ke kanne baandhte hue socho ki tumhari patang kyon kati. Aur phir doosri udaao." Isn't this the technique that we should be employing in everything that we do? So much of wisdom is all around us and we never ever tap it simply because we do not care to talk to each other. We talked about many more miscellaneous things about Kite Museums, material used to make kites, Kite Flying festivals and purani dilli in general. We also visited the workshop they make kites and jewellery in, on the thirds floor of their home. And on the terrace, we visited their pigeon coup that is the home of 100s of their pet pigeons and talked about how the homing pigeons find their homes. 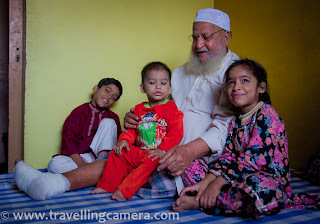 Bhai Mian is now retired and usually leaves all kiting to his sons, Jamal and his brothers. At night, he can sleep peacefully because he knows that his tenaciously built legacy is safe in his sons' expert hands. In the 2 hours that we spent at their place, we were touched by their hospitality and their trust. Bhai Mian and Jamal and even the children of their family opened their hearts to us and made us feel welcome. 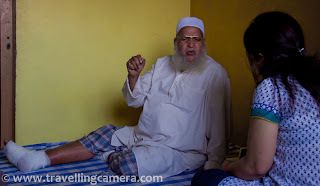 From practically being the outsiders in Delhi 6, we were now a part of the ecosystem and felt that we were being entrusted with the deep-rooted secrets of this enigmatic place where people like Bhai Mian live humble, unassuming, and unpretentious lives. These are the people who you pass every time you stroll through the streets of Delhi 6 and never ever realize how much they've acheived in their lives and how much our society owes to them. It was a pleasure once again to Meet the Street. Soon we will meet a security guard who considers the security of each member of the residential society he's stationed at as his personal responsibility. The purpose of this project is to bring to light the people you are likely to run into on the streets of Delhi and the project does not discriminate based on gender, age, social status, financial status, and anything else for that matter.